With the final major capability for BPF tracing (timed sampling) merging in Linux 4.9-rc1, the Linux kernel now has raw capabilities similar to those provided by DTrace, the advanced tracer from Solaris. As a long time DTrace user and expert, this is an exciting milestone! On Linux, you can now analyze the performance of applications and the kernel using production-safe low-overhead custom tracing, with latency histograms, frequency counts, and more. 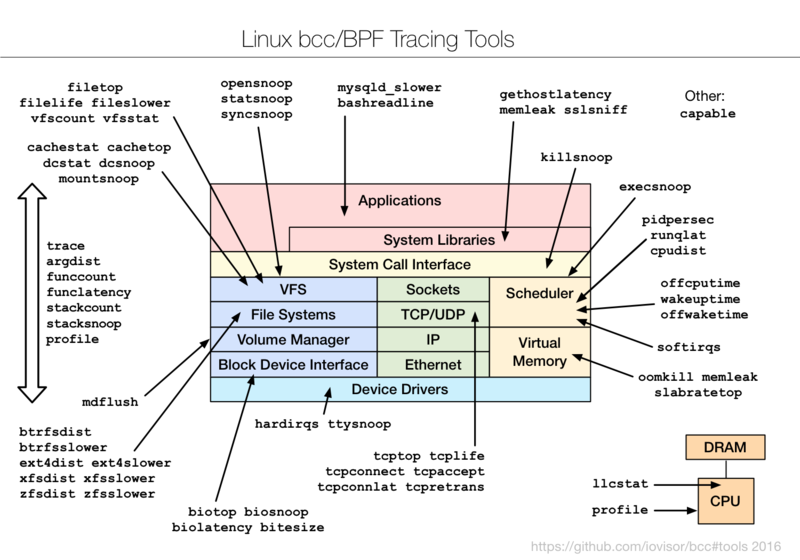 There have been many tracing projects for Linux, but the technology that finally merged didn’t start out as a tracing project at all: it began as enhancements to Berkeley Packet Filter (BPF), aka eBPF. At first, these enhancements let BPF redirect packets to create software-defined networks. Later on, support for tracing events was added, enabling programmatic tracing in Linux. While BPF currently lacks a high-level language like DTrace, the front-ends available have been enough for me to create many BPF tools, some based on my older DTraceToolkit. In this post I'll describe how you can use these tools, the front-ends available, and discuss where the technology is going next. I've been adding BPF-based tracing tools to the open source bcc project (thanks to Brenden Blanco, of PLUMgrid, for leading bcc development). See the bcc install instructions. It will add a collection of tools under /usr/share/bcc/tools, including the following. Tracing off-CPU time (us) of PID 24347 by user + kernel stack... Hit Ctrl-C to end. Many tools have usage messages (-h), and all should have man pages and text files of example output in the bcc project. In 2014 I joined the Netflix cloud performance team. Having spent years as a DTrace expert, it might have seemed crazy for me to move to Linux. But I had some motivations, in particular seeking a greater challenge: performance tuning the Netflix cloud, with its rapid application changes, microservice architecture, and distributed systems. Sometimes this job involves systems tracing, for which I'd previously used DTrace. Without DTrace on Linux, I began by using what was built in to the Linux kernel, ftrace and perf_events, and from them made a toolkit of tracing tools (perf-tools). They have been invaluable. But I couldn't do some tasks, particularly latency histograms and stack trace counting. We needed kernel tracing to be programmatic. BPF adds programmatic capabilities to the existing kernel tracing facilities (tracepoints, kprobes, uprobes). It has been enhanced rapidly in the Linux 4.x series. Timed sampling was the final major piece, and it landed in Linux 4.9-rc1 (patchset). Many thanks to Alexei Starovoitov (now working on BPF at Facebook), the lead developer behind these BPF enhancements. I'd been holding off on this post until the last major feature was integrated, and now it has been in 4.9-rc1. There are still some minor missing things we have workarounds for, and additional things we might do, but what we have right now is worth celebrating. Linux now has advanced tracing capabilities built in. BPF and its enhancements are designed to be production safe, and it is used today in large scale production environments. But if you're determined, you may be able to still find a way to hang the kernel. That experience should be the exception rather than the rule, and such bugs will be fixed fast, especially since BPF is part of Linux. All eyes are on Linux. We did hit a couple of non-BPF bugs during development that needed to be fixed: rcu not reentrant, which could cause kernel hangs for funccount and was fixed by the "bpf: map pre-alloc" patchset in 4.6, and with a workaround in bcc for older kernels. And a uprobe memory accounting issue, which failed uprobe allocations, and was fixed by the "uprobes: Fix the memcg accounting" patch in 4.8 and backported to earlier kernels (eg, it's in the current 4.4.27 and 4.4.0-45.66). Why did Linux tracing take so long? Prior work had been split among several other tracers: there was never a consolidated effort on any single one. For more about this and other issues, see my 2014 tracing summit talk. One thing I didn't note there was the counter effect of partial solutions: some companies had found another tracer (SystemTap or LTTng) was sufficient for their specific needs, and while they have been happy to hear about BPF, contributing to its development wasn't a priority given their existing solution. BPF has only been enhanced to do tracing in the last two years. This process could have gone faster, but early on there were zero full-time engineers working on BPF tracing. Alexei Starovoitov (BPF lead), Brenden Blanco (bcc lead), myself, and others, all had other priorities. I tracked my hours on this at Netflix (voluntarily), and I've spent around 7% of my time on BPF/bcc. It wasn't that much of a priority, in part because we had our own workarounds (including my perf-tools, which work on older kernels). Using BPF tools/metrics: There should be no difference. Tools behave the same, GUIs can access similar metrics. Most people will use BPF in this way. Developing tools/metrics: bcc right now is much harder. DTrace has its own concise language, D, similar to awk, whereas bcc uses existing languages (C and Python or lua) with libraries. A bcc tool in C+Python may be a lot more code than a D-only tool: 10x the lines, or more. However, many DTrace tools used shell wrapping to provide arguments and error checking, inflating the code to a much bigger size. The coding difficulty is also different: the rewriter in bcc can get fiddly, which makes some scripts much more complicated to develop (extra bpf_probe_read()s, requiring more knowledge of BPF internals). This situation should improve over time as improvements are planned. Running common one-liners: Fairly similar. DTrace could do many with the "dtrace" command, whereas bcc has a variety of multitools: trace, argdist, funccount, funclatency, etc. Writing custom ad hoc one-liners: With DTrace this was trivial, and accelerated advanced analysis by allowing rapid custom questions to be posed and answered by the system. bcc is currently limited by its multitools and their scope. In short, if you're an end user of BPF tools, you shouldn't notice these differences. If you're an advanced user and tool developer (like me), bcc is a lot more difficult right now. Note the embedded C (text=) in the Python code. This gets the job done, but there's also room for improvement. Fortunately, we have time to do so: it will take many months before people are on Linux 4.9 and can use BPF, so we have time to create tools and front-ends. * opensnoop.stp    Trace file open()s.  Basic version of opensnoop. Wouldn't it be nice if we could have the SystemTap front-end with all its language integration and tapsets, with the high-performance kernel built in BPF back-end? Richard Henderson of Red Hat has already begun work on this, and has released an initial version! Although, I think the real challenge for tool developers won't be the language: it will be knowing what to do with these new superpowers. Promotion: There are currently no marketing efforts for BPF tracing. Some companies know it and are using it (Facebook, Netflix, Github, and more), but it'll take years to become widely known. You can help by sharing articles and resources with others in the industry. Education: You can write articles, give meetup talks, and contribute to bcc documentation. Share case studies of how BPF has solved real issues, and provided value to your company. Fix bcc issues: See the bcc issue list, which includes bugs and feature requests. File bugs: Use bcc/BPF, and file bugs as you find them. New tools: There are more observability tools to develop, but please don't be hasty: people are going to spend hours learning and using your tool, so make it as intuitive and excellent as possible (see my docs). As Mike Muuss has said about his ping program: "If I'd known then that it would be my most famous accomplishment in life, I might have worked on it another day or two and added some more options." High-level language: If the existing bcc front-end languages really bother you, maybe you can come up with something much better. If you build it in bcc you can leverage libbcc. Or, you could help the SystemTap BPF or ply efforts. GUI integration: Apart from the bcc CLI observability tools, how can this new information be visualized? Latency heat maps, flame graphs, and more. What about SystemTap, ktap, sysdig, LTTng, etc? It's possible that they all have a future, either by using BPF, or by becoming better at what they specifically do. Explaining each will be a blog post by itself. And DTrace itself? We're still using it at Netflix, on our FreeBSD-based CDN. I've also giving a talk about bcc/BPF, at Facebook's Performance@Scale event: Linux BPF Superpowers. In December, I'm giving a tutorial and talk on BPF/bcc at USENIX LISA in Boston. Van Jacobson and Steve McCanne, who created the original BPF as a packet filter. Barton P. Miller, Jeffrey K. Hollingsworth, and Jon Cargille, for inventing dynamic tracing, and publishing the paper: "Dynamic Program Instrumentation for Scalable Performance Tools", Scalable High-performance Conputing Conference (SHPCC), Knoxville, Tennessee, May 1994.
kerninst (ParaDyn, UW-Madison), an early dynamic tracing tool that showed the value of dynamic tracing (late 1990's). Mathieu Desnoyers (of LTTng), the lead developer of kernel markers that led to tracepoints. IBM developed kprobes as part of DProbes. DProbes was combined with LTT to provide Linux dynamic tracing in 2000, but wasn't integrated. Bryan Cantrill, Mike Shapiro, and Adam Leventhal (Sun Microsystems), the core developers of DTrace, an awesome tool which proved that dynamic tracing could be production safe and easy to use (2004). Given the mechanics of dynamic tracing, this was a crucial turning point for the technology: that it became safe enough to be shipped by default in Solaris, an OS known for reliability. The many Sun Microsystems staff in marketing, sales, training, and other roles, for promoting DTrace and creating the awareness and desire for advanced system tracing. Roland McGrath (at Red Hat), the lead developer of utrace, which became uprobes. Alexei Starovoitov (PLUMgrid, then Facebook), the lead developer of enhanced BPF: the programmatic kernel components necessary. Many other Linux kernel engineers who contributed feedback, code, testing, and their own patchsets for the development of enhanced BPF (search lkml for BPF): Wang Nan, Daniel Borkmann, David S. Miller, Peter Zijlstra, and many others. Brenden Blanco (PLUMgrid), the lead developer of bcc. Sasha Goldshtein (Sela) developed tracepoint support in bcc, developed the most powerful bcc multitools trace and argdist, and contributed to USDT support. Vicent Martí and others at Github engineering, for developing the lua front-end for bcc, and contributing parts of USDT. Allan McAleavy, Mark Drayton, and other bcc contributors for various improvements. Thanks to Netflix for providing the environment and support where I've been able to contribute to BPF and bcc tracing, and help get them done. I've also contributed to tracing in general over the years by developing tracing tools (using TNF/prex, DTrace, SystemTap, ktap, ftrace, perf, and now bcc/BPF), and books, blogs, and talks. Finally, thanks to Deirdré for editing another post. Linux doesn't have DTrace (the language), but it now does, in a way, have the DTraceToolkit (the tools). The Linux 4.9 kernel has the final capabilities needed to support modern tracing, via enhancments to its built-in BPF engine. The hardest part is now done: kernel support. Future work now includes more performance CLI tools, alternate higher-level languages, and GUIs. For customers of performance analysis products, this is also good news: you can now ask for latency histograms and heatmaps, CPU and off-CPU flame graphs, better latency breakdowns, and lower-cost instrumentation. Per-packet tracing and processing in user space is now the old inefficient way. So when are you going to upgrade to Linux 4.9? Once it is officially released, new performance tools await: apt-get install bcc-tools. For updates on bcc/BPF tools, see bcc (github) and my eBPF Tools page.